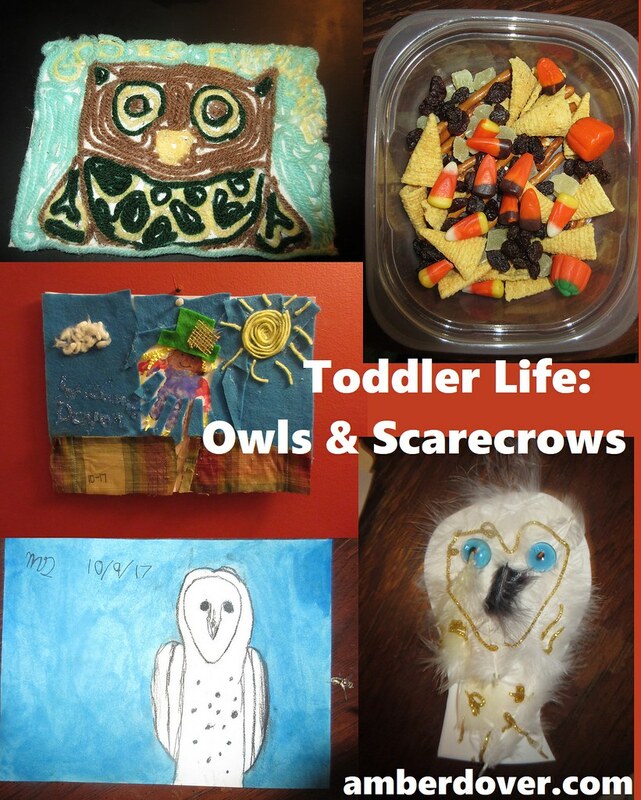 In this post: Fun treats, crafts, and activities for owls and scarecrows! Some art for older kids too! Leeland and I made a foam owl using feathers and glass stones (for the eyes). I made this yarn owl painting. It’s hard to read but it says “God is everywhere”, our theme during Sukkot. This cute book The Midnight Library has lots of sweet owls. The artwork is lovely. Handprint Scarecrow Mixed Media Art– I was inspired by this post for Leeland’s handprint scarecrow. I decided to add the fabric. Then we watched and sang I’m a Little Scarecrow. I made Leeland a scarecrow hat from a bowl and yarn. Leeland painted it brown. We had scarecrow crunch! I put candy corn, pretzels, Bugles, raisins, and dried pineapple bits in ours. We brought out our homemade scarecrow from years ago and put him outside. We read scarecrow books and watched several youtube videos. I’ll share my favorite next. The Lonely Scarecrow is a sweet short film.